Orok ayil aimak is located very close to Bishkek. 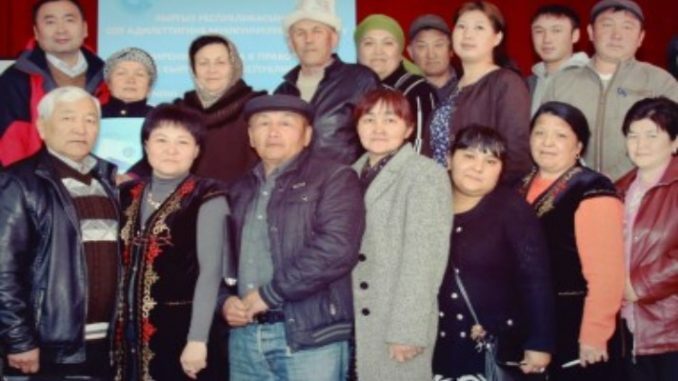 It might seem the access to justice and legal opportunities of the residents of this municipality are much more favorable than in other remote localities of Batken and Naryn oblasts, however we all should remember the increase of the legal literacy and awareness of citizens of their rights is an extremely important task for the Government and citizens themselves including the most remote rayons. Recently the staff members of the family doctors group in Orok ayil aimak approached me to ask if there was an opportunity to provide finance assistance to a young lady Nargiz as her 4 years daughter urgently needed operation on a liver. The girl was infected with echinococcosis and was several times operated but as her health was deteriorating, a new surgery was needed. Besides her two children, Nargiz had to look after several brothers and sisters. The only source of income was occasional work in Dordoi market. According to Nargiz, doctors in one of hospitals in Bishkek requested 30 000 kyrgyz soms for making a surgery. I wanted to contact my colleagues from UNDP and launch money collection campaign – we had a good tradition of donations earlier but later on I recalled that in accordance with the government program of guaranteed medical help, citizens older than 70 years and children under 5 are entitled to receive free government medical help. I failed to meet the doctor of the department of children’s hospital who requested the payment for the surgery as he was on leave. Nevertheless the chief doctor of the hospital met us and was surprised to hear his colleagues asked for the money. He carefully studied the medical records and immediately ordered to admit the child as she urgently needed surgery. Moreover, being a practicing surgeon, he promised to make the surgery himself. He also promised to bring to account the doctor who asked for money. The surgery was successful and Nargiz’s daughter is now recovering. This case taught Nargiz the awareness of one’s rights is not only useful, but rather vitally important. March 2016 within the UNDP project “Widening access to justice in the Kyrgyz Republic” there were conducted trainings for the staff members of ayil okmots, members of ayil keneshs, village heads, members of the courts of elders, women’s councils, youth committees, school teachers as well as representatives of the civil society and local NGOs. The purpose was to raise the legal literacy of the citizens. These participants were selected because they are official and non–official local representatives whom the citizens approach, seeking help. These people, to the extent of their competence, try to consult in solution of their legal problems. “I am a village headman and receive various requests from villagers. During the training I received useful knowledge on how to properly advise – I am aware of new opportunities of the legal aid center in applying to professional lawyers using Internet and new IT developments,” – shared his thoughts Urmat Barbakov, headman of Kyzul–Oktyabr village. “Issues of access to justice and legal empowerment of vulnerable population” trainings were organized in Kyzyl–Oktyabr and Burana aimaks of Chui oblast. Citizens living in rural areas, especially those representing vulnerable groups like rural women, children, youth and PWDs still have very limited access to justice and legal opportunities. Rural areas that accommodate the majority of the population of the Kyrgyz Republic, practically do not have qualified lawyers as well as providers of relevant legal services. The research conducted at the initial stage of the Project launch showed the nearest professional legal services’ providers were located in cities and district centers. This significantly jeopardizes access to legal aid for vulnerable people. “It is for the first time I attend the training on access to justice, rights and guarantees to vulnerable people. I realized I have to learn a lot on this topic. In the villages I frequently meet people with disabilities and witness the problems they face. We only installed a ramp at the entrance of the club but now I can tell them about their rights and guarantees,” – told Talai Suranbaev, director of the rural culture club, Kyzyl–Oktyabr village. We believe citizens, having legal knowledge can improve the quality of their life and can access to justice and shall learn to protect their rights in all situations of their life.